(Bloomberg) -- The top members of the Senate Intelligence Committee want the chief executive officers of Facebook Inc., Alphabet Inc.’s Google and Twitter Inc. to appear at a public hearing to answer questions about the security of their platforms, including the companies’ relationships with Chinese telecommunications firms. Lawmakers in the U.S. and elsewhere are increasingly scrutinizing big tech companies, particularly over how they collect reams of personal data from their users and what they do with it. Several members of Congress had also criticized Facebook in recent days after the company revealed it had data-sharing partnerships with four Chinese consumer-device makers. 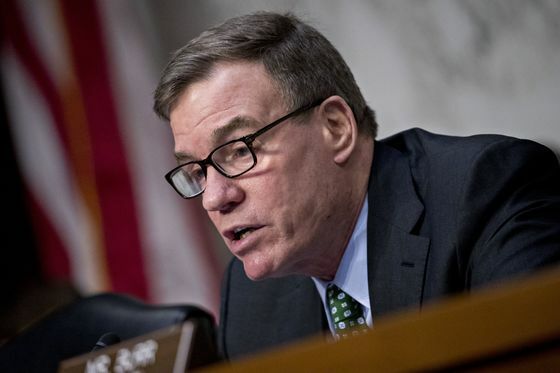 Mark Warner, a Virginia Democrat who is vice chairman of the Senate Intelligence Committee, asked Google in a letter Thursday about its ties to device makers Huawei Technologies Co. and Xiaomi Corp., probing whether user data was stored on phones or allowed on the Chinese companies’ servers and how storage agreements were monitored and enforced. "The possibility of Chinese vendors with documented ties to the Chinese Communist Party having access to" software tools that could give them access to user data from Alphabet subsidiaries "raises serious national security concerns," Warner wrote in the letter. He also sent a similar letter to Twitter Inc.
Google isn’t promising testimony but a spokesman said the company looks forward "to answering these questions." Warner also asked Google for information about a partnership with Tencent Holdings Ltd., operator of China’s largest social messaging service WeChat. In January, Google and Tencent struck a patent-sharing deal and agreed to team up on developing future technology. Google had "agreements with dozens" of international device makers, Google spokesman Colin Smith said. "We do not provide special access to Google user data as part of these agreements and our agreements include privacy and security protections for user data," Smith said. Warner said Thursday he was happy he wasn’t part of a hearing earlier this year with Facebook CEO Mark Zuckerberg, when many senators showed they didn’t know a lot about social media or how the tech companies gather and store private data. “I think now we’ve got a lot more information,” Warner said. Warner and Senator Richard Burr, Republican from North Carolina and chairman of the committee, have previously talked about holding the social media hearing in relation to their probe concerning Russian influence during the presidential election in 2016. But Warner also has asked Google and Twitter if they had similar deals with Chinese technology companies that Facebook has since disclosed. Huawei said it never collected or stored Facebook user data. Separately, Facebook apologized Thursday for a software bug that set millions of users’ posts “public” in May, even if they were intended for a smaller audience. The Wall Street Journal reported earlier that members of Congress have begun scrutinizing part of Google’s Android operating system partnership with Huawei. Representative Mike Conaway of Texas, who led the House Intelligence Committee’s probe into Russian election interference, is among congressional Republicans now pressing for more information on the Google-Huawei ties, said his spokeswoman, Emily Hytha. “I’m concerned across the board that Americans don’t understand what’s being done with their personal data," the Senate’s No. 2 Republican, John Cornyn of Texas, said. "Obviously they are learning now that Facebook and certainly Google are using their data as part of their business model to make money." Senator Tom Cotton, Republican of Arkansas, connected his concern to Google’s recent decision not to renew a contract with a Pentagon drone program, known as Project Maven, after extensive protests from employees of the internet giant. “The fact that Google would refuse this contract, while at the same time doing business with a virtual arm of the Chinese Communist Party, tells you everything you need to know about its sense of patriotism," Cotton said in a statement. Along with existing trade tension between the U.S. and China, the tech companies’ relationships with Huawei are drawing added scrutiny because the U.S. considers the Chinese firm a security risk. Congress has barred the Pentagon from buying Huawei gear, along with ZTE Corp., citing the companies’ connections to the Chinese government and the potential for intellectual-property theft and spying. Huawei is a "Chinese national-security threat to the United States and any collaboration there is a problem," Cornyn said. Huawei, China’s largest maker of telecommunications equipment, was founded in 1988 by former Chinese army officer Ren Zhengfei.